Anytime a development team undergoes a paradigm shift, it’s inevitable that some developers will fall behind in the new approach. This is the exact scenario that Intel IT encountered as they made the shift to a cloud-native development strategy – so they took this challenge as an opportunity. 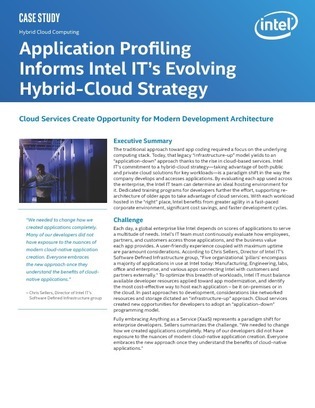 Click into this case study to learn how Intel IT caught their developers up to speed with their new hybrid, cloud-native methodology, and how they re-architected their applications to gain heightened agility, give developers more space to build, and squeeze cost-efficiency from their existing business-critical applications.